Egg omelet right out of the waffle iron and ready to eat. I freeze half for another meal. One of these days I should make this with fresh ingredients but this is one of my go-to recipes when I have leftovers to use, especially vegetables. I have yet to make these the same way twice in a row so know this is very flexible and easy to do, I would add this to your collection of basic recipes if you don't already have it. This serving was made with four egg yolks with 2 tablespoons of water added since I used the egg whites in another recipe. You can also use regular eggs with a yolk and egg white, I just had the yolks available from another project. Then I minced a few cherry tomatoes that had seen better days and drained the juice off before adding to the eggs. If you add the juice it makes the mixture too runny. I also added a dash of minced yellow onions, cut up fresh cilantro and some fresh rosemary sprigs from a rosemary plant growing in one of my bay windows. Fresh herbs make everything taste better! Eggs can have a lot of things added included old cherry tomatoes and fresh herbs. You can add grated cheese if you have some, or leftover additional protein like baked chicken or salmon but I didn't have any available. You can mix all of the ingredients in the same container, then add seasonings. I like garlic salt and a dash of regular salt. Other options are black pepper, chili seasoning and cumin. Here's the egg omelet mixture ready to use, add something green to brighten up the mixture. Spray the waffle iron with non-stick cooking spray on both sides, heat it to the recommended temperature and pour the mixture in to cook. Let the mixture stand in the waffle iron for a few seconds before removing so you don't tear it. Cooking in my mother's old waffle iron almost ready to remove. Let it sit for a few seconds first. You can also make these and freeze them for breakfast, I used to do that when I was going to an office every day to work. Cut up vegetables to taste: a dash each (that's about 1/8th of a cup) of yellow or red onions; green peppers; tomatoes; broccoli. I frankly don't add additional protein unless I have something that has no future in my cooking except to be added to these eggs. Or I need the container for something else. I can get pretty attached to a particular container! To freeze, cut up into quarters and place on a small cookie sheet in freezer for about an hour, then store in a freezer bag for later use. Have you made these before? I saw one of these for sale in a gardening catalog and did a double-take. Ripening green tomatoes, or most other green fruits and vegetables, is not hard to do, and you certainly don't have to buy an expensive gadget to do it. I use a brown bag inside a copper pot so that the bag can be stored on my counter. The key is adding a fruit - either an apple or banana, and sealing the brown bag so the natural gas ethylene, which fruits generate, will help ripen whatever is still green. I use this ripener to help mangos, guavas, tomatoes, and sometimes bananas and grapes get ripe. Check once a week or so. Smaller fruits and vegetables like tomatoes may ripen faster than larger ones. Remove any tomatoes that are getting dry; others may start going brown. Also periodically replace the fruit - an apple may last for a couple of months before it needs to be replaced. Apples last longer than bananas in brown bags. I top the copper pot with a little glass plate and use it as a fruit plate. It's purely decorative but it is a good reminder to periodically check the brown bag. You can also just keep your green tomatoes, or other produce, in a brown bag in a dark cabinet corner. Tie a ribbon to the door knob to remind yourself to check it once a week or you won't want to try to ripen anything again. How do you ripen your fruits and tomatoes? This was my first time planting snow peas and I was pretty excited. I love them in stir fry, or just to munch fresh. All of a sudden one morning in my little vegetable garden, I had snow peas. I thought about getting out the wok but it was too late. Homegrown beets usually show up at our farmer's markets mid-summer. Beets are a simple and easy vegetable to fix. To cook beets, cut off the top leaves at the base of the stem and clean off roots. Boil until soft to a fork. Steam leaves until they are also tender. Serve with a little sprinkling of lemon juice and real mayo. How about that, two vegetable dishes from one vegetable and no recipes required! I usually end up with more green onions than I need. It's not that I don't appreciate them; they usually get stuck in the back of a crisper, which is a sure ticket to the compost. When I'm working with onions, I will cut all of them up and then freeze extra by placing them in a plastic container in the freezer. Once they're individually frozen, I move them to a small plastic bag or container. I can then easily toss them into a salad, soup or any dish. And talk about a delightful surprise when you find one of these frozen containers mid-winter! When I buy a bunch of green onions, I always look for those little tell-tale new, thin shoots coming out of existing roots. Once I cut off the green part, I pot the roots; water well, and place in a sunny window with indirect light. 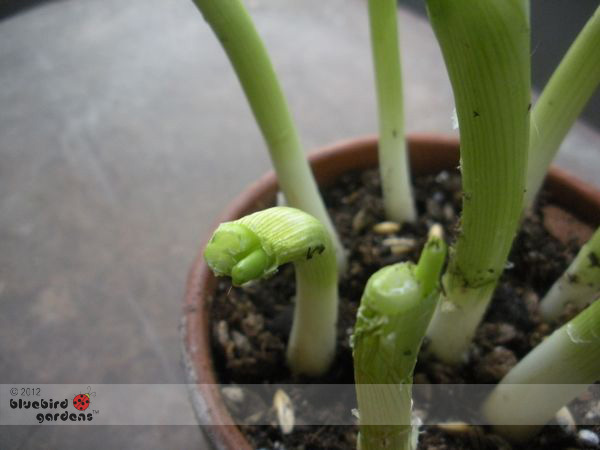 In just one day, I can see new fresh green onions growing. Now that's fresh! Now a few words about eating daylily buds. Daylilies last - well, one day, hence the name, but during their blooming season, they make a lot of buds. Years ago, I read a Missouri Department of Conservation wild edibles book that suggested frying buds in a corn meal batter to make a fritter. I don't eat fried foods so I took the plunge and bit into a raw orange daylily bud and - they taste like one of my all-time favorite vegetables, asparagus! For a salad treat, I pick a handful and toss them in salad greens. Make sure you're picking flowers that haven't been exposed to pesticides. Daylilies are high in vitamin C so not only pretty but healthy and eye-catching, too! Not that garlic is all that hard to track but, in my garden, where I sometimes mix vegetables with flowers, it's good to have a system. I was given 7 different kinds of garlic to plant this year. To keep track of what and where I planted them, I sunk old plastic flower pots and planted the garlic in them. I also made stakes from popsicle sticks to keep track of varieties but Cousin George the raccoon had other plans for those sticks. I'm only sure now of where the elephant garlic is blooming. With the help of pots, I can at least find the other garlics. This is an easy side dish to use up winter squash and green peppers. 1/2 cup of either water, chicken broth or wine, and cover. Cook on low for about 20 minutes. Add 1 tsp garlic powder or regular salt. You can serve either hot or cold. I prefer this dish cold but it's also wonderful warm right out of the pan. You can serve this with almost any protein or main dish.